Walking is considered one of the easiest and most effective forms of exercise. It’s true, as long as you are not dealing with foot pain that makes every step painful. Foot pain is a common problem. Nearly one in five adults in a community study to assess the prevalence of the problem reported having foot pain. The 2008 study published in the Journal of Foot and Ankle Research found that it was more common in women than men and mostly associated with increased age, obesity and pain in other areas of the body. Foot pain has a significant detrimental impact on health-related quality of life, the study also noted. Most of us do not devote much care to our feet until it’s too late and we’re in pain. It’s easy to take them for granted when they are working properly. Our feet bear our body weight when we are standing and help us move around with ease. The foot has almost as many bones as the hand and wrist. Pain or discomfort can occur in the toes, heels, arches, soles or other parts of the foot. 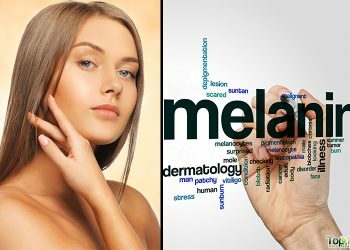 It can range from mild to severe and may last a short time or be an ongoing issue. No matter what, an aching foot takes the pleasure out of most daily activities. Pain in the feet can be due to several reasons, both lifestyle factors and serious health problems. You can get rid of mild pain at home. However, for serious pain, you need to see a podiatrist. Here are the top 10 reasons why your feet hurt all the time and how to fix it. One of the main causes of foot pain is wearing high-heeled shoes, as they put a great deal of pressure on the toes. Any heel that is over 2.5 inches can put a lot of pressure on the ball of the foot and constrict your foot’s natural shape, leading to pain. Apart from pain, high heels can contribute to a host of issues, such as stress fractures, bursitis, sprained ankles and neuroma. Choose shoes with thicker heels for better balance and reduced pressure. Alternate between shorter and higher heels to give your feet a break from foot pain. It is better to opt for open-toe high heels, as this type of shoe limits the pressure and discomfort. If you have blisters, opt for padding and cushions for blisters, which you can easily find in the market. After a long hectic day, soak your feet in warm water with a little salt for 15 minutes. Before going to bed, give the soles of your feet a nice massage. This helps improve circulation and reduce pain. Wearing poorly fitting shoes can also cause foot pain. When shoes are too tight or too narrow, your toes have to bear a lot of pressure. The toes start rubbing against your shoes, causing irritation and pain. As you are on your feet most of the time, walking around in shoes that don’t fit well is also harmful for the muscles, joints and ligaments in your feet, legs, hips and back. It is important to check your shoe size from time to time. Feet continue to change with age. Get your feet measured at least once a year when you are out shopping for shoes. Invest in a good, solid pair of shoes with a textured sole and ankle support. Buy new shoes regularly, about every 6 to 8 months. Always buy shoes in the late afternoon. Your feet tend to swell a little after you’ve been walking around for most of the day, and you’ll want to buy shoes that feel comfortable from morning to night. When shopping for a pair of shoes, make sure to try on both shoes and walk a few steps. Along with shoes, look for socks that come with special padding in specific areas, such as the toe and heel areas. If needed, consult a podiatrist to help you choose the right type of footwear. Foot pain is a common complaint during pregnancy, just like morning sickness, back strain, fatigue and tiredness. Your legs and feet tend to get more tired due to the increasing body weight. As the weight gain continues, a woman’s center of gravity is completely altered. This puts added pressure on the knees and feet. Foot pain often gets worse as the day progresses, especially during the second and third trimesters. The good thing about foot pain and swelling during pregnancy is that they eventually go away after delivery. Keep your feet elevated as often as you can. Drink a lot of fluids, as dehydration can worsen swelling as well as pain. Improve the circulation in your ankles with rotation exercises. With your feet elevated, place a cold compress on your feet for 15 to 20 minutes, 2 or 3 times a day. Ingrown toenails cause a throbbing, painful sensation, and usually affect the big toes. An ingrown toenail occurs when the side edge of your nail curls down and digs into the toe’s skin, causing pain that makes you aware of a toe that you don’t normally even think about. Wearing shoes that are too tight or too narrow can exacerbate an ingrown toenail. Enjoy a warm water foot soak a few times a day to reduce swelling, pain and tenderness. To increase the effectiveness, add a little Epsom salt or apple cider vinegar to the water. 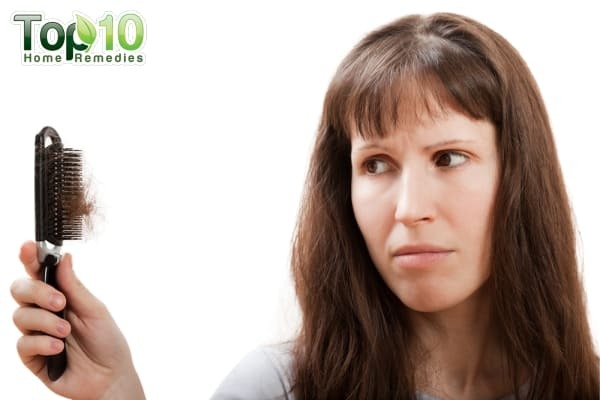 After soaking, you can use cotton or floss to gently lift the nail edge so that it doesn’t grow further into your skin. You can trim the nail yourself if there’s no infection. In case of an infection, always see your doctor or a podiatrist. To help prevent this problem, always cut your toenails straight across and don’t file the corners down. Standing is a natural human posture, but working in a standing position on a regular basis for long hours can cause sore feet, swelling in the legs as well as pain. It even increases the risk of various foot and leg problems, due to the increased strain on the bones, joints, tendons, muscles and ligaments. Also, standing for long periods of time accelerates tiredness and fatigue. If your job requires that you stand most of the time, wear comfortable shoes. While standing, periodically shift your weight from one leg to the other. Take sitting breaks of 10 minutes for each hour of standing. From time to time, stretch your legs. 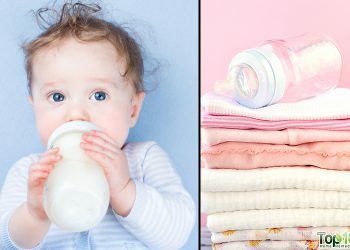 Roll a cold or frozen water bottle under your feet for about 20 minutes before going to bed. While sleeping, prop up your feet so they are higher than the rest of your body to reduce swelling and pain. For those who have flat feet, discomfort and pain is a common problem. Flat feet is often an inherited defect of the foot that eliminates the arch. However, this problem can develop due to wearing high heels for long periods of time or repeated long hours of standing at a job. The flat shape of the soles of your feet puts strain on the ligaments in your ankles. This causes pain in the ankles as well as the feet. It even causes pain and weakness in the foot and stiffness in the lower back. Walk barefoot, especially over terrain like a beach, whenever you can to give your tired muscles a good workout. Do heel cord stretching exercises, to stretch and lengthen the Achilles tendon and posterior calf muscles. Make sure to buy shoes with the right kind of support, such as arch supports, or look into getting custom orthotics. A high uric acid level in the body is another cause of foot pain. 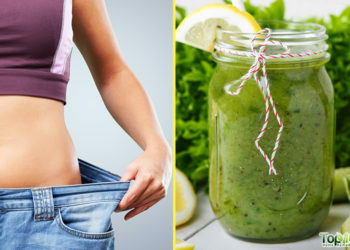 Uric acid is a waste product of the oxidation of purines and normally is excreted in the urine. 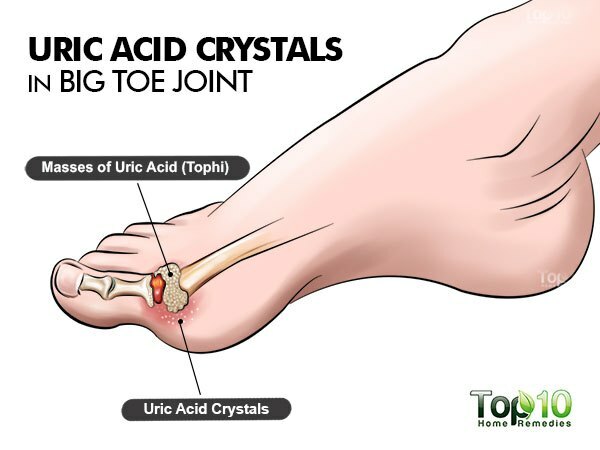 A high amount of uric acid in the body is one of the leading causes of gout, in which uric acid crystals deposit in the cooler parts of the body like the joints of the hands or feet. These uric acid crystals cause inflammatory arthritis, which causes pain in the feet and elsewhere in the body. Drink plenty of water to help optimize uric acid filtering. 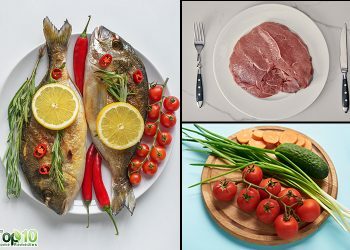 Avoid animal proteins like meats, organ meats, fish and poultry. Avoid legumes, yeast, mushrooms, asparagus and beans, which are high in purine. Eat foods high in dietary fiber. Eat foods with starchy carbohydrates, which contain only small amounts of purine. Bunions are another common cause of foot pain. In simple terms, a bunion is a deformity that develops on a big toe. It can affect one or both big toes. People who have bunions are likely to experience pain in the foot as well as hip, knee and low back. It can cause extreme pain while walking as well as reduced flexibility of the big toe. Bunions are progressive and usually get worse over time, thus the pain may increase with time. Bunions also increase the risk of corns and calluses. To relieve pain, use a cold compress on the affected area. Massage the area with warm oil daily. Roll a tennis ball beneath the sole that feels tight and painful. Wear proper shoes, with a wide toe box and a low heel, to reduce the severity of pain. Avoid wearing narrow shoes, pointy toes and high heels. Use orthotics, padding and splinting to help relieve pain. If required, bunions may be removed with surgery. Being a diabetic, you are at a higher risk of developing diabetic neuropathy that causes nerve damage in the feet. 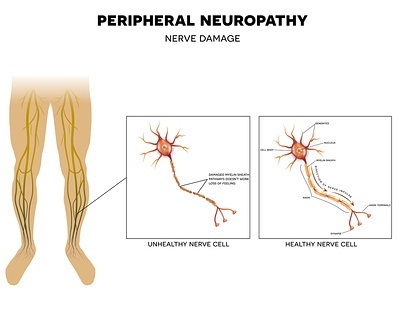 Diabetic neuropathy symptoms include burning or tingling pain and sometimes numbness. Foot pain due to neuropathy is one factor that affects walking ability. In many cases, diabetes can lead to poor blood circulation in the lower half of the body, specifically the lower legs and feet. This poor circulation adds to heel and foot pain. Take necessary steps to keep your blood sugar level under control. Clean your feet daily using warm water and a mild antiseptic soap. Use a soft towel to dry your feet and between your toes. Use orthotic braces or supportive shoes after consulting your doctor. Plantar fasciitis, also known as jogger’s heel, is another common cause of foot pain. It causes acute pain in the heel and sole of the foot. The pain is often the worst in the morning when you take your first steps out of bed, or if you have been sitting or lying down for a while. 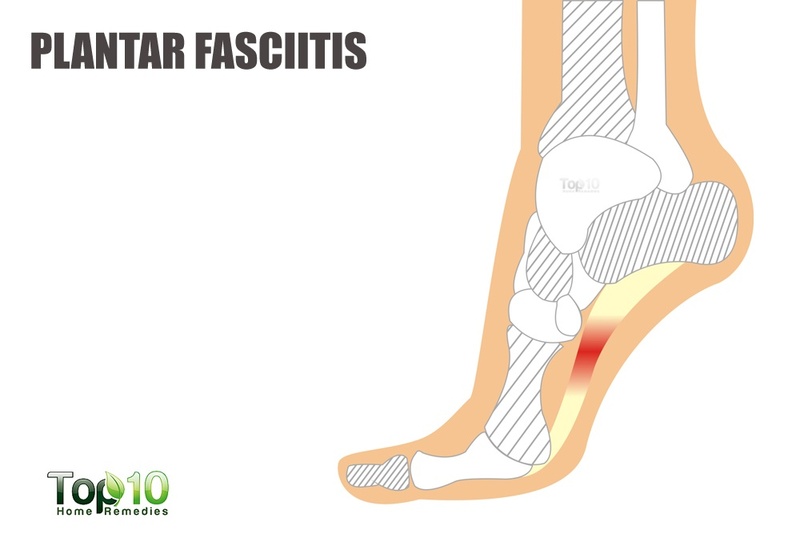 Plantar fasciitis results from inflammation of the plantar fascia, a thick band of tissue that runs along the bottom of your foot from the heel to the toes. It is common in athletes who run and jump frequently, middle-aged people and those who are overweight. Do stretching exercises that involve your feet and lower leg muscles, a few times a day. Massage your feet with warm oil a few times daily. Apply ice for 15 to 20 minutes, 3 or 4 times per day to reduce swelling. Limit the use of high-heel footwear. Wear shoes that offer adequate arch support. Avoid standing on your feet for long periods of time.